Ants are pesky creatures. They invade your home, eat your food, and hang around rent-free. 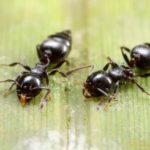 You don’t have to live with these uninvited guests – and you don’t have to pay an exterminator to take care of your ant problem (unless it’s really bad). There’s one simple, natural way to get rid of ants: borax. You know that borax is natural, but what exactly is it, and where can you find it? Most of us pass right by borax in the laundry aisle, and it’s an ingredient in many household products, including detergents and enamel glazes. So how exactly do we get borax? Most of the borax found in stores comes from seasonal lakes. When these lakes dry up, salt and other trace minerals are left behind. For commercial purposes, most of these lakes are fed by springs that contain borate and sodium, which form sodium tetraborate. In most cases, the trace minerals are removed from borax when it’s sold commercially. How Does Borax Work to Kill Ants? If borax is a natural substance derived from lakes, how exactly does it kill ants? For borax to work its magic, ants have to eat it. Once consumed, the powder interferes with the ant’s digestive system, and the ants suffer a slow death. The substance actually causes gas build-up in the ant’s digestive system. Because ants have no way to pass the gas, they die from the build-up. While that may sound cruel, a slow death is a good thing for you if you want to get rid of an ant infestation. This means that worker ants have more time to take the bait back to the nest and share the poison with the colony. Is It Safe to Use Borax to Get Rid of Ants? Borax has long been used as an eco-friendly alternative to traditional cleaning products. It’s often used in recipes for homemade laundry detergents and cleaning solutions. But in recent years, the health community has been questioning the safety of borax. In the science community, borax is largely considered non-toxic to people and animals. With that said, borax is not safe for ingestion and should never come in contact with your eyes or skin. If you plan to work with borax, you may want to wear a pair of gloves and take care not to get any of the powder in your eyes. The biggest concern with skin or eye contact is irritation. Lots of other natural products can also irritate the skin and eyes, including vinegar and certain essential oils. Officially, borax is given a safety rating of “1,” which is the same rating given to salt and baking soda. Still, if you plan to use this substance to kill ants, make sure your traps are out of reach of the kids and pets. Ants have invaded your home, and you’d rather not call in an exterminator. Borax is an effective solution, and there is a simple way to make a homemade trap that will kill the entire colony. One of the most popular homemade ant traps is made up of borax and sugar water. As you know, ants love sugar, so they’ll find this trap irresistible. Mix the borax, water and sugar together in a large jar. Make sure you use something disposable and that you wear gloves when handling the borax. Soak the cotton balls in the solution. How many cotton balls should you soak? That depends on the severity of your ant problem. The bigger the problem, the more cotton balls you will need. After you’ve soaked your cotton balls, it’s time to start setting your traps. You have a few options here: you can set the cotton balls out, or you can place the cotton balls on the lid of a jar or onto a paper plate. Place the traps in strategic locations. Pay attention to where the ants are entering the home. Ants tend to march in lines because they follow a chemical trail left by other ants who found a source of food. You can also place cotton ball traps on top of ant mounds. The ants will feed on the borax solution, and bring some of the food back to the nest to share with the rest of the colony. It’s important to remember that this method will take some time to work, but it’s highly effective. 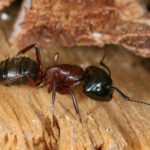 Borax will kill the ants, but the process can sometimes take a few weeks, depending on the severity of the infestation. Just be patient, and set out more traps as needed to control the ant population. Along with the borax traps, you also want to make sure that you seal up any cracks, crevices, gaps or holes in and around your home. These serve as entryways for ants to come inside your home. Sealing these openings will help prevent future infestations.